Gray Area — Who Will Treat Aging Boomers? When the last baby boomers turn 65 in 2030, there will be an estimated 70 million older adults in the United States. But will there be enough healthcare professionals to care for them? Based on the existing number of professionals dedicated to caring for elders, the future is less than promising. That’s nothing new. The field has always survived with small numbers of geriatricians, but the coming wave of baby boomers poses an even bigger demand for aging care—and geriatric physicians aren’t equipped to handle the staggering numbers. Suzanne Fields, MD, chief of the division of geriatrics and general internal medicine at Stony Brook University Medical Center in New York, points to research from the Association of Directors of Geriatric Academic Programs. As of 2009, there were 7,300 geriatricians, a 5.4% decrease from 2000. “That’s half the number currently needed,” she says. In 2007, only 264 medical residents chose to enter geriatrics nationwide. Should the downward trend continue, by 2030 there will be a shortfall of approximately 24,000 geriatric doctors. It’s a future for aging care that causes significant concern, but it’s not surprising. One reason for the lack of geriatricians is that geriatrics is a specialty in which it’s very difficult to earn a living, says Resnick, thanks to a lack of prestige, low pay, and ongoing issues related to reimbursement for long term care services through Medicare. “People want to do it, but you can’t do it and survive. It’s not that everyone wants to drive a Porsche. You have to be able to maintain a practice, and at the current rate of reimbursement, it can’t be done,” she says. Plus, doctors earn more money on reimbursement for advanced procedures such as cardiac bypass surgery, for example. Aging care, at its core, isn’t focused on specialized procedures but may instead center on talking with families about end-of-life care. “It’s a critical part of the practice and so important for patients and their families, but there’s no reimbursement for this,” says Resnick. Beyond that, says Fields, there’s a declining interest in primary care, which feeds into the geriatric program. “As we have fewer numbers [of medical students] in primary care, we naturally will have fewer entering geriatrics,” she notes. What are some solutions to boosting the number of geriatricians? Direct reimbursement is one, and the AGS recently petitioned Congress for payment reform. Another consideration is offering scholarships or forgiveness on tuition debt for students choosing the geriatrics field, which is already in place in some states. Furthermore, the AGS has proposed a new policy that will “require all adult practitioners to be trained as geriatric practitioners,” says Resnick. This is already the case at many medical universities around the nation. The benefits of such programs are vast. First, the training educates residents in the how-to of caring for older individuals so that every physician receives geriatrics training. Second, it ensures that the skills, competencies, and attitudes of medical doctors from all fields become more positive with respect to older adults, explains Charles Reynolds, MD, a professor of psychiatry, neurology, and neuroscience at the University of Pittsburgh who specializes in geriatric psychiatry and care. At the University of Maryland, Resnick is already seeing positive results among medical students who have said they wouldn’t have gone into geriatrics had they not been exposed to long term care and assisted-living rotations. “We have to make sure that every healthcare provider is trained in the appropriate care for older adults. We need geriatricians to teach and train doctors. They [geriatricians] will be specialists, but everyone will be skilled in it,” says Resnick. Fields has seen a great response at Stony Brook too. “We’re trying to make geriatric training in the mainstream of physical training. We’ve run workshops and retreats to teach junior residents geriatric medicine. We are seeing a lot of success with this model,” she says. Consider it insurance. “Even if it doesn’t produce more geriatricians, we will produce doctors who have some skill in caring for the elderly,” says Fields about the exposure to geriatrics training. A possible future scenario involving overwhelming numbers of aging boomers may find teams of healthcare providers caring for elders, pairing midlevel practitioners alongside primary physicians, notes Fields. The practitioner shortage also means boomers will have less access to geriatric expertise, meaning patients may face longer waits for specialists, says Reynolds. Still, he paints an upbeat picture of the future of geriatric medicine. “The workforce shortage is a challenge, yes. But the field, from a scientific and educational perspective, could not be more exciting or rewarding,” he says. Fields agrees. 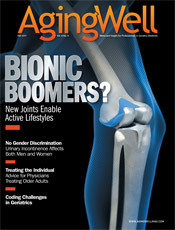 “Surveys show that geriatricians have been among the most content physicians. They make a huge difference in improving the quality of life for so many people, and that’s rewarding,” she says. 5. Mayo Clinic, Rochester, Minn.
6. Duke University Medical Center, Durham, N.C.
9. Yale-New Haven Hospital, New Haven, Conn.